Yes, I am back! I've been busy working on other things, but now it's time get come home to my first born. Plus, there's just so much to talk about lately! With all that's happening in comics and film, it's a great time to be a geek! I mean c'mon; a full trailer for Star Wars AND Batman vs Superman on the same weekend?!? Face it kids; these ARE the good ol' days! what do you think? For me, it's a little too gangster (or should I say "gangsta" for those of the more urban vernacular) mixed in with unstable crack/meth user. I don't really dig the tattoos as I feel they've been stripped from generic t-shirt designs found at your local Wal-Mart. I would like to see what he will be wearing in the film, as the clothes truly make the psychotic super villain, but I'm scared it will involve saggy purple jeans and a green wife-beater. 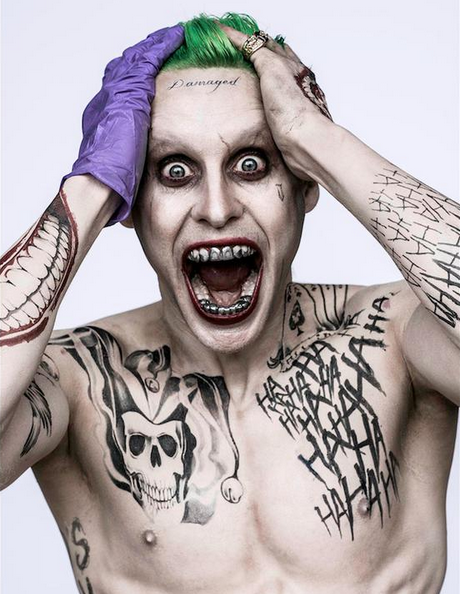 I guess my only hope is that Leto's considerable acting chops will make up for and distract from this hot mess. We will remove Leto from existence just to prevent this "abomination"
At least he's a good actor, which at least gives me a glimmer of hope. IT is libtard PC crap. Absolutely right - DC has a spotty record at best, and while I commend them on such a bold choice for a movie concept, it's just such a gamble. We'll see. I heard that the tattoos are not actually going to be in the final look, they were just kinda stuck on there last minute. Still, not sure how I feel about this iteration even if it didn't have tats. Final Four Episodes of The Flash!! !